This entry was posted on Wednesday, January 4th, 2017 at 3:31 pm. Like all pieces of the riding habit, the history of the ratcatcher, (also known as the show shirt or the informal hunt shirt), is one laced in mystery and intrigue. No one knows for sure how the name “ratcatcher” came into being, but there are multiple theories on which we can build. Yes, Shakespeare, “that which we call a rose by any other name would smell as sweet,” but “ratcatcher” does not portray a particularly pleasing vision. How did a simply-cut, fashionable shirt garner such a name? One source concludes that the style was inspired by the clothes of the actual rat catchers who lived and worked in England during the Victorian era. These catchers would wrap scraps of fabric and other material high around their necks to protect them from being bitten as they hunted the disease-ridden rodents. Another (not so endearing) source claims the term was developed in regards to the class level within the fox hunt. The ratcatcher is an informal hunting shirt, and it was said that those who hunted informally were no better than those who hunted rats. It was thought that unless one hunted formally, with proper attire, one might as well be member of this lower-class profession. A third source also looks to the foxhunt to make the connection. While out hunting, a rat-catcher or terrier-man, would follow along with the hunt on foot where he would use his little dogs to chase the foxes out of their hiding spots. His duties were similar to the ones performed by the rat-catchers in the cities who would sometimes also use terriers to flush the rats out of their homes. Finally, a fourth source claims that the term was developed, again, on the hunt fields during off-season. It states that these types of shirts were worn during informal hunting periods when foxes were out of season. During this time, riders would hunt anything just for the sport of it, sometimes even rats. The modern equestrian world may never know exactly where the term ratcatcher stemmed from, but one can assume it was a combination of the four theories above. Regardless, it appears that all believe the shirt was created during the Victorian era (approximately the mid to late 1800s) in England. Right again, Shakespeare, the clothes do make the man, or rather, the equestrian. Since the days when men wore these high-necked shirts to fend off vicious rats, the equestrian world embraced the use of it and wore it happily in the hunt field. While today’s show shirts come in a wide variety, their basic structure is the same with the following traditional features: tall wrap collar, covered placket, button-down shirt, semi-fitted body, and long sleeves. The term placket typically refers to the double layers of material that hold the buttons and buttonholes in a shirt. Plackets can be found almost anywhere on a shirt (neckline, cuff of the sleeve), as well as at the waist of a skirt or pants. The collar of a ratcatcher is in the mandarin-style, and it’s covered by a separate, matching choker (or stock tie). This style derives its Western name from the attire worn by Mandarins in Imperial China. A mandarin collar is short, straight, unfolded, and starts at the neckline and rises vertically one to two inches. The edges of the collar either barely touch in the center in front of the neck, or overlap slightly. The overlapping collars are typically a continuation of the shirt’s placket. While the ratcatcher’s style crossed over into the equestrian world via foxhunting, these shirts are still worn today in English riding disciplines. The traditional, classic shirt is white with long sleeves. Recent enhancements, however, include pastel-colored shirts that match the jacket. Additionally, sleeveless shirts can be worn as long as the jacket remains on. Stock ties are still worn; however, stock pins on the ties are beginning to be replaced with the rider’s initials embroidered on the choker. Stock ties, or stocks, are an integral part of today’s ratcatcher, but they were worn daily by gentlemen as early as the seventeen hundreds. The formal stock tie is either black or white and made out of fine cotton, silk, or gauze. They made their way into the equestrian realm by way of the hunt field (as usual) as a safety precaution. In case of injury to either horse or rider, the tie may be used as a temporary bandage. Today, we equestrians have more options with ratcatchers than we ever could have dreamed. The material is typically cotton or polyester, but some shirts have built-in spandex, mesh backings for added breathability. 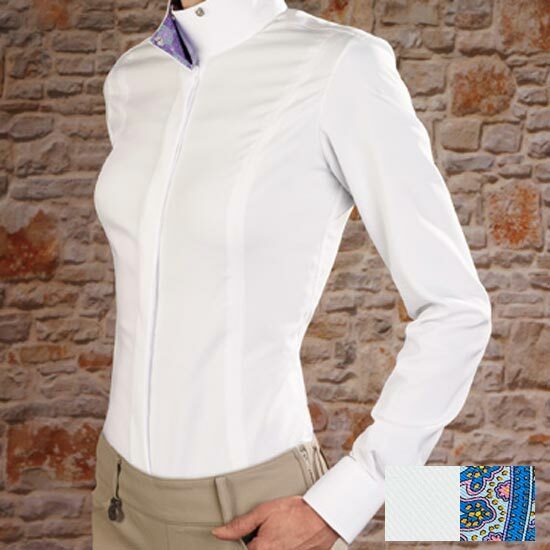 Shirts are tailored beautifully with custom, feminine cuts designed to give equestrians the mobility they desire. Some have stock ties that are already attached, so leaving one behind at a show is a thing of the past. Ratcatchers also come in vibrant colors and patterns both with and without rhinestone embellishments. While the ratcatcher may have had a less than glamourous beginning, it has since flourished. Today’s shirts are beautifully constructed with the comfort and fit of the individual in mind. Our stylish ratcatchers portray a look of pride and confidence in and out of the show ring – no rodents necessary!